NHL News : Rumored off ice injury to Milan Lucic has been confirmed! Rumored off ice injury to Milan Lucic has been confirmed! Lucic seen wearing a cast. 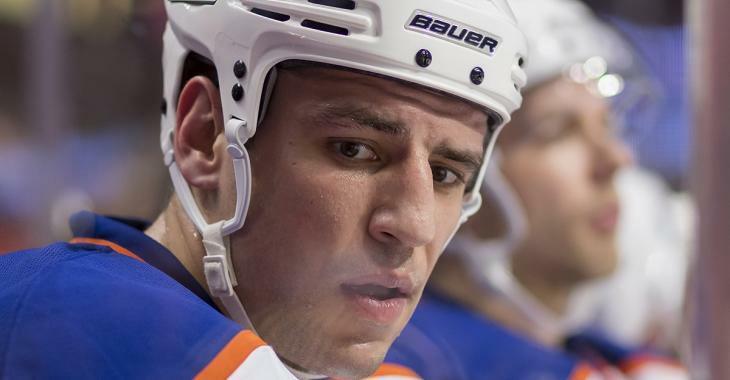 It is official, the terrible campaign that was the 2018 - 2019 National Hockey League season has gone from terrible to even worse for Edmonton Oilers veteran forward Milan Lucic. Last week pictures began to circulate on social media that purported to show Milan Lucic hobbling around with a cast on his leg and with the use of crutches, but the fact that Lucic was the man in those photographs was never concerned. If you're wondering why we did not share that news with you it was due to the fact that Lucic was photographed with his family at the time and sharing a somewhat creepy photo, one taken without his permission no less, of his partner and young child did not seem to be the right way to go for with something that was only a rumor. Even prior to those pictures surfacing on social media though there were reports that Lucic had been involved in some kind of altercation in a Calgary bar some time around the Oilers final game of the season, which coincidentally was also in Calgary where the Oilers took on the Flames. Those of course were only rumors at the time and even now we still have not received anything that could be considered confirmation about whether or not that is in fact what happened. What I will say is that this story was around quite a bit and the fact that this rather serious looking injury to Lucic has been kept under wraps by the Oilers and the media in Edmonton would seemingly indicate to me that there may be something to those rumors. Milan Lucic suffered a lower body injury and is currently in a cast of some sort. Not sure on timeline at this point or how the injury happened. Further to Lucic injury - Happened off ice after practice Friday in Calgary. Will remain in cast for 2 more weeks, and the injury won't affect his regular summer training schedule. Expected to be 100% for training camp. I may be wrong here, but it certainly feels like the Edmonton media is complicit in keeping the details of this story fuzzy.